What is human nature? Are there innate, hierarchical, human needs and motivations? Have they transformed? What are the social-political implications? Over seventy years ago Abraham Maslow submitted “A Theory of Human Motivation” (1943). His subsequent pyramid-shape hierarchy of needs captured the world’s imagination by suggesting that humans are driven by innate needs for survival, safety, love and belonging, esteem, and self-realization, in that order. Nearly all academic works eventually fall into oblivion, some instantaneously. One third of social science articles go utterly uncited (Remler 2014). Some pieces, however, do outlive their authors, and continue to live in the minds of their peers and followers. Think of Thomas Kuhn’s The Structure of Scientific Revolutions, which currently leads the list of most cited works in the social sciences and the humanities, followed by Everett Rogers’ Diffusion of Innovations, Paulo Freire’ Pedagogy of the Oppressed, and Michael Porter’s Competitive Strategy (Green 2016). Have you read, or at least heard of, all four? If not, you are in good company. Even the most cited works often remain obscure beyond their designated field, and almost all are unknown beyond academia. The fate of Maslow’s hierarchy of human needs is different. It has resonated powerfully in scholarship across disciplines. More interestingly, it remains, some 75 years after its articulation, well known beyond the ivory tower. Whenever I try to introduce Maslow’s pyramid to first-year students, I quickly realize it needs no introduction. They have heard of it, have seen some popularized versions of it, before, and it struck a chord. Instinctively, it feels familiar. The continued resonance of Maslow’s theory in popular imagination, however unscientific it may seem, is possibly the single most telling evidence of its significance: it explains human nature as something that most humans immediately recognize in themselves and others. This symposium is a plea for social scientists to reengage the human condition, to realize, as Maslow and others have, that we cannot explain social actions without understanding human motivations. This symposium brings together scholars and students who share Maslow’s fascination with the foundations of the human experience. We explore the merits and limitations of Maslow’s theory, focusing on what recent generations have taught us about human nature, needs and motivations. Are we gradually moving up the pyramid, leaving behind worries about survival and safety, or has globalization pushed us back to those bare necessities compounding them with an elusive search for belonging and esteem? Is self-actualization still a viable goal or has it become a mere advertising device in a consumerist society? Can we add more blocks to Maslow’s pyramid, and change its shape to better reflect (modern) humanity or what it could, and should, become? We seek to unearth these haunting questions, and look for answers. Three sections make up the symposium: in the first, Foundations, Liah Greenfeld, Amitai Etzioni and Douglas Kenrick examine the premises of Maslow’s pyramid, exploring the relevancy of the hierarchy today. Greenfeld submits that Maslow’s thesis does not capture “universal human needs”: the lower needs are animalistic, and the higher needs do not reflect universal human nature, but only the nature of modern democratic societies. Etzioni commends Maslow for going beyond the “homo economicus,” but criticizes him for ascribing the higher needs to the individual self, forgetting that people are also moral creatures, wrestling between good and bad, on both individual and societal levels. Kenrick takes the societal connection to the realm of evolutionary biology, suggesting that rather than heading towards self-actualization, humans – once they achieve their somatic goals – invest their efforts in mating and parenting. 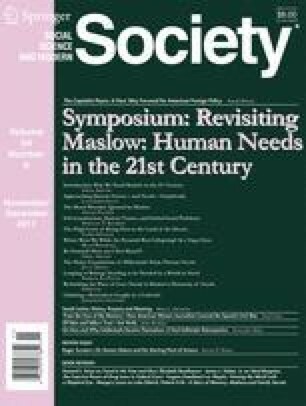 In the symposium’s second section, Society & Politics, Carol Graham, Ruth Whippman, and Uriel Abulof examine the resonance of Maslow’s thesis in contemporary societies and their politics. Graham employs the metrics of well-beingto show the high costs of American poverty and inequality, most evident in stress, insecurity, and hopelessness among poor white. Whippman warns against Maslow’s pyramid collapsing in on itself: the emphasis on self-actualization comes increasingly at the expense of basic needs – the middle class can barely make ends meet – undermining the very base of the pyramid. Finally, Abulof argues that the call for self-actualization, read authenticity, has wavered between essentialist imperative (be yourself!) and existentialist doubt (how am I not myself? ), and while the former has been winning, both privately and publicly, the latter has also not expired. The symposium concludes with a unique section: Young Perspectives. Instead of asking veteran scholars to speak about the young generation, we asked up and coming scholars, graduate students, to speak for themselves – about the human needs they experience, and those they may help reshape, and fulfil, in the coming decades. Julia Trehu argues that millennials have growing doubts about their capacity to fulfill the basic, material, needs of the pyramid, and while many seek self-actualization through self-indulgent individualism, others venture into reshaping their socio-political sphere in radical ways. Shirley Le Penne suggests that millennials do not merely feel a need to belong, but to be needed – to gain a sense of self-worth – in a world that increasingly requires their help. Or Oved argues that love is a foundational need, not just part of the higher psychological needs, and that its importance may moreover precede the need for safety. Jacqueline Gufford, in the concluding piece, notes that Maslow seamlessly speaks of man’s basic needs, and that shifting our gaze to modern women allows us to see humans not climbing a pyramid but entangled in a cobweb, where love and self-actualization often pull in different directions. This symposium has grown out of a workshop held in the spring of 2017 at Princeton University, organized and sponsored by the Liechtenstein Institute on Self-Determination, the Sociology Department, the University Center for Human Values (all at Princeton University), and the Communitarian Network. We thank the participants and organizers of the workshop, in particular Wolfgang Danspeckgruber, Miguel Centeno and Jenna Spitzer, with whom we build this pyramid, which is now before you – to behold, ascend, and transcend.